People are nuts. The iPhone has a global launch today. 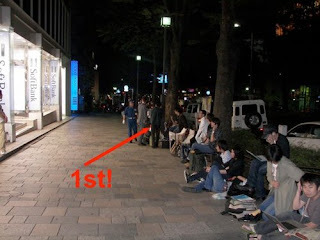 Here in Japan, I kid you not, people started lining up on the streets of Tokyo in front of SoftBank (the cell company that is launching the iPhone here with Apple) on WED! The phone comes out on the 11th. Friday. Sheesh. Ok, I get it, it is a cool looking phone--internet gadget, but you have got to be kidding me.